Meet the Builder and Manager of your dealership�s website ... you. Showcase Builder can build a website to fit the needs and wants of any dealership, from the largest auto-mall to the smallest privately owned dealer. 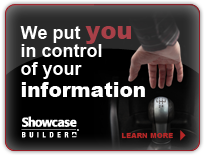 Showcase Builder makes managing and updating your dealership's website easy and convenient. No matter the size or scope of your dealership there is a Showcase Builder plan to fit your needs. Our professional developers have done the work for you, now you can update your website as often as you want with no extra software required on your computer! Connect to our user-friendly administration screen and update your information through use of the Showcase Builder Editor. Plans starting as low as $50/month with no start-up fees.